We knew it would be a huge, close weekend at the box office between “Interstellar” and “Big Hero 6,” and it looks like the Mouse House is the big winner, at home anyway. Disney’s latest animated picture brought in an estimated $US56.2 million at the box office over the weekend. That’s more than both “Tangled” and “Wreck-It Ralph,” which the film was tracking ahead of at the end of last week. Some analysts predicted the Disney film could hit as high as $US66 million. Early numbers for director Christopher Nolan’s “Interstellar” are reporting box office at $US52.2 million. That’s slightly short of expectations which had the film outpacing the opening weekend for last year’s sci-fi space epic, “Gravity.” That film made $US55.8 million upon debut. Here’s how that compares to the opening for Nolan’s other films. It makes more sense to compare “Interstellar” with “Inception” rather than his Batman superhero trilogy. Final numbers will most likely adjust upwards. How did Disney get the edge over Nolan’s movie? “Big Hero 6” was showing in 3D, meaning higher ticket prices (Christopher Nolan isn’t a fan of the format). Families were most likely heading out to see “Big Hero 6” in groups. There were more showings of “Big Hero 6” since the film’s runtime (108 mins.) is a lot shorter than Nolan’s nearly 3-hour sci-fi flick. “Big Hero 6” is Disney Animation’s followup to billion dollar movie, “Frozen.” People want to know if Disney can pull off another success story. When you factor in the foreign box office, Nolan’s sci-fi film is killing it. The movie has already made $US80 million overseas. 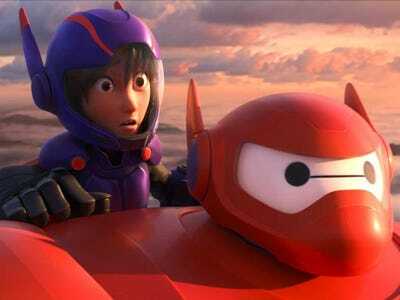 At the end of the big weekend, “Interstellar” has made $US132 million while “Big Hero 6” has taken in $US79.2 million. Paramount and Warner Bros. are hoping the film has staying power at theatres which could become tough with the next instalment of “The Hunger Games” in theatres Nov. 21. Regardless of which movie came out on top, this was one of the biggest and most significant box-office weekends of 2014 as it was the first weekend where two films debuted above $US50 million at the box office. That’s something that has only happened four times at the box office.